Jim Thorpe: super athlete, Olympic gold medalist, Native American. Pop Warner: indomitable coach, football mastermind, Ivy League grad. Before these men became legends, they met in 1907 at the Carlisle Indian School in Pennsylvania, where they forged one of the winningest teams in the history of America’s favorite sport. Called “the team that invented football,” Carlisle’s innovative squad challenged the greatest, most elite teams—Harvard, Yale, Army—audaciously vowing to take their place among the nation’s football powers. This is an astonishing underdog sports story—and more. It’s an unflinching look at the U.S. government’s violent persecution of Native Americans and the school that was designed to erase Indian cultures. It’s the story of a group of young men who came together at that school, the overwhelming obstacles they faced both on and off the field, and their absolute refusal to accept defeat. I always know when I pick up a Steve Sheinkin book that I'm going to get a good story. Undefeated was no different. And being a football fan I found the book a fascinating look back at the early years of the game. But as with Sheinkin's other titles, he's picked a topic I knew very little about and turned it into a great read. 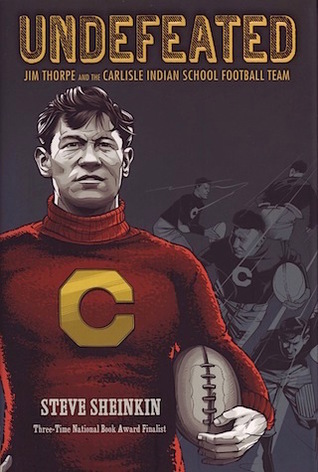 While the book focuses on football and the impact that the Carlisle Indian School's football team made on the sport, there are other themes in the book. It was hard to read about the school itself and it's goal of 'civilizing' the Indian children put into their care. I felt horrible as I read about how the students' names were changed, hair was cut, and clothes provided, all with the intention of making these Native children more white and supposedly more civilized. The long hours of study as well as work left the students with very little free time. No wonder so many students ran away. Even worse is that once they graduated (for those few who did), they had few options available to them. Except for a few who found success, most of them were either rejected by whites for employment or returned home having lost much of their language and culture. For some of the students, football provided a bit of a relief. In fact, in a narrative that sounds all too familiar, these athletes (once the program took off) received rather preferential treatment (at least compared to the other Native students). What's especially remarkable is that from the outside, the Native students didn't seem like they would be competitive in a game that emphasized size and power. None of the students who played for Carlisle were huge and powerful and at first it was a major disadvantage. Then along came Coach Pop Warner, who recognized that what these young men lacked in size and power, they made up for in speed, agility, and sheer determination. Combining Warner's innovative approach to the game and willingness to try new things with the indomitable will of his players led to some remarkable results. And things really took off when Jim Thorpe joined the team. I knew the name before I picked up the book, but it was interesting to find out more about this remarkable athlete. His story is both remarkable and somewhat sad at the same time. His athletic achievements are legendary, even today. The way he dominated in both track and football would be hard to replicate in this day of specialization. And reading about the sheer amount of time he and his teammates spent on the field playing both offense and defense just made me tired. In addition to facing teams who didn't see their smaller team as much of a threat, the Carlisle students also faced a great deal of prejudice from both opponents and the media. It was painful to read about the way they were treated. And yet in the end, the Carlisle football team left a lasting mark on the game as they helped develop innovations such as the forward pass, deception in play calling, and new plays that no one had ever seen before. While those who lived out those years didn't all have happy endings, there is no doubt they left their mark both on and off the football field.